The chart above shows that, to date, the effort to recover some of the lost oil from the Deepwater Horizon well has not been as effective as Gulf Coast residents would have hoped. The Deepwater Horizon rig, owned by Transocean and leased by British Petroleum, suffered a catastrophic blowout on April 20, 2010. The ensuing explosion and fire claimed 11 lives, and the vessel sunk two days later. As she went down, the riser pipe attached to the well was damaged, allowing oil to spew nearly uncontrolled one mile below the surface. On April 24, the US Coast Guard announced that it had discovered the leak, but, believing that the leak was not as significant as it would turn out to be, did not activate a plan in place since 1994 to immediately contain and burn off oil as it reached the surface. Several days of bad weather dispersed the oil, and the the size of the spill grew beyond the capability to trap and burn it. This caused the cleanup strategy to change from one of collect-and-burn to collect-and-treat. The results have been disappointing. The dark brown line shows the cumulative release of oil from the well since the day the leak was discovered. For this series, I've chosen the mid-point of the government's range estimate of 500,000 to 1 million gallons per day. The actual amount of oil released could be anywhere from around 23 million to 46 million, and officials have said that the flow rate has varied on an almost daily basis. So, the mid-point of the range seems reasonable. The red line shows the amount of oily water recovered over time by skimming, booming and other collection methods at sea. Officials have said that the oil-and-water mixture contains about 80% water and about 20% oil (on average). 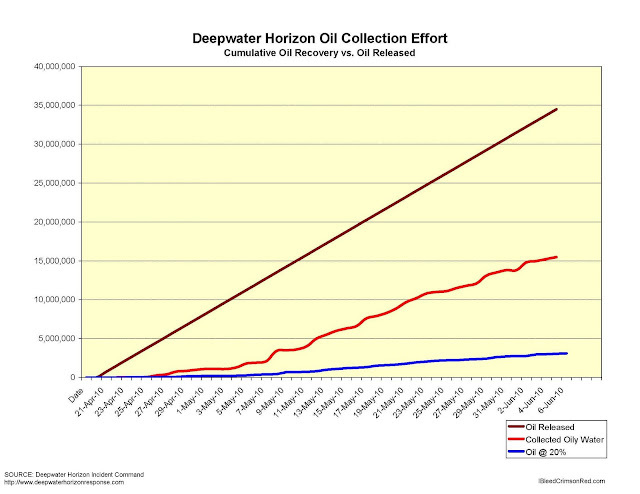 So, the blue line represents the actual amount of crude oil recovered from the Gulf waters. To date, somewhere in the neighborhood of 35 million gallons of hydrocarbons have been spilled into the Gulf. Some of that material is also natural gas, and there is no way of ascertaining the proportion of gas to oil. So the actual figure could be somewhat less, or somewhat more, depending on how much material is being ejected and what the actual hydrocarbon mix is. But less than half of that amount, or about 15 million gallons, has been collected in the diluted oil-water mix. And, since that mixture only represents about 20% oil, somewhere in the neighborhood of 3.0 million gallons of actual crude have been recovered, leaving more than 30 million gallons to foul marshes, wash up on beaches, destroy wildlife habitat and kill untold numbers of wildlife. Both BP and the federal government bear some responsibility for the failed cleanup and containment effort. BP bears some of the blame because mobilizing equipment in a large enough scale to perform a robust collection effort is expensive. They wouldn't volunteer the option if they didn't think they had other, less expensive options. But the federal government shoulders the blame, as well. For starters, reports issued in the aftermath of the accident showed that there was a culture of substance abuse and promiscuity between regulators with Minerals Management Service and oil company officials. Reports also documented lax inspection and safety controls for years, but particularly in the weeks leading up to the disaster. Secondly, after the incident, the government didn't begin to fully mobilize resources under the Oil Pollution Act until April 29, nine full days after the incident and five full days after the spill was discovered. President Obama did not name an Incident Commander until May 1, eleven days after the incident and a full week after the spill was detected. For federal officials to claim that they've been on the job "since day one" is a laughable farce. Furthermore, the 1994 in-situ burn plan called for the staging of specialized fire boom in the area so that the plan could be implemented without delay. However, neither the Coast Guard, nor BP, nor Minerals Management Service had even one linear foot of the material on hand. Indeed, in order to conduct the alleged "test burn" on April 28, the Coast Guard had to order the boom material from a supplier in Illinois! And lastly, under the Oil Pollution Act of 1990, the United States government has the authority to direct the "responsible party" to take whatever action the government deems necessary in order to minimize damage and protect property. Knowing as soon as April 24 that the Deepwater Horizon incident could morph into an unprecented environmental disaster, the government essentially allowed BP to tell them what the plan was. No one seemed to have a clue; no one seemed to be in charge. America watched and waited through the failures of the sequential solutions: from Top Hat to Top Kill. What made it all the more frustrating is that a few enterprising media reports mainly outside the media mainstream told us President Obama apparently had options that could have -- and probably should have -- been ordered while we waited for the leak to be plugged. Especially the supertanker vacuuming solution. We learned of it from the web sites of Esquire Magazine and America Online. Esquire was the first to tell us about a 1993 effort in which Saudi Arabia used empty oil tankers to siphon away a huge oil spill at sea. Saudi Aramco, the huge oil company, reportedly kept the leak and the solution secret so the world wouldn't focus on the fact that perilous oil leaks can happen. Esquire and aol.com interviewed a Saudi Aramco engineer at the time, Nick Pozzi, who detailed what had occurred: a flotilla of empty tankers pumped the vast oil-and-water slick into their cargo holds, then sailed to ports where the oil was removed and the water was returned to the sea. Former Shell Oil Company president John Hofmeister also told reporters from both organizations that the tanker-vacuuming plan had worked -- and urged that it be tried in the Gulf of Mexico. He repeated his recommendation on NBC's Today Show -- so it got into the media mainstream, even though no tankers were commandeered and sent into the Gulf.